Few sounds strike more fear into an enemy of Terrinoth than the thundering hooves of a column of armored destriers. Each mount is bred and trained for war. Each rider is a lifelong professional warrior or an avowed knight, sworn to a baron’s or Free City’s service until the riders final breath. Rider and mount work together on the battlefield in perfect synergy, charging into combat and crushing the enemy in a wave of steel. 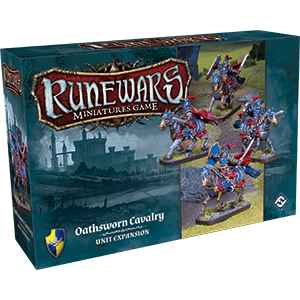 With the Oathsworn Cavalry Unit Expansion, you gain four new Oathsworn Cavalry figures – enough to field a two-tray unit or increase the size of another unit. These fearsome knights are sworn to fight for the Dragon Lords and protect the realm, and they are first introduced in the Runewars Core Set. This unit expansion is a perfect way to quickly increase your cavalry and unlock new options with five new upgrade cards for any army.